[Image: Photo by Vienna-based photographer Wolfgang Thaler]. 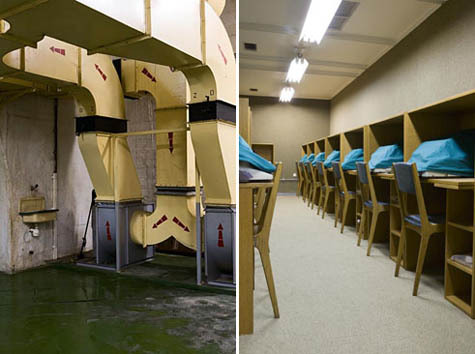 Journalist Christoph Hinterreiter recently teamed up with photographer Wolfgang Thaler to document a nuclear bunker called D-0 in what is now Bosnia. 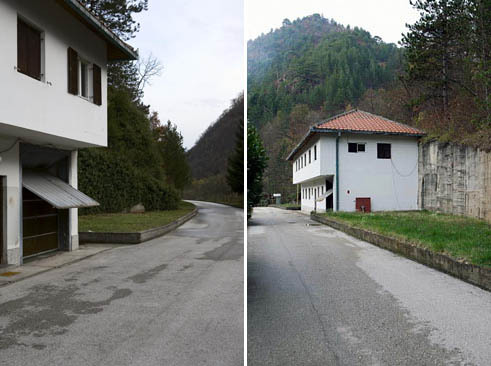 The bunker was the largest structure of its kind, and was for use by the upper echelon of the former Yugoslavia. 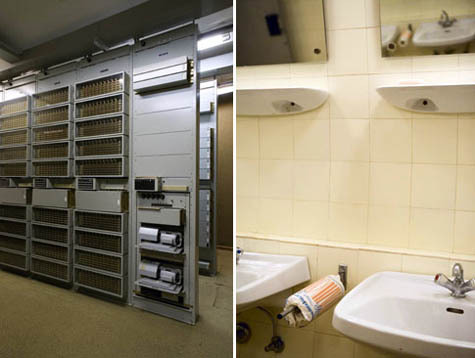 The premises are still fully furnished and equipped with military apparatus—code books are positioned beside telexes and restrooms are equipped with originally wrapped paper towels. Its construction lasted for 26 years (1953 – 1979) and it cost 4.6 billion USD. The bunker's construction required "20,000m3 of excavated material," Hinterreiter adds, all of which "was secretly transported from the site. A major part was further processed in the nearby JNA quarry and disguised as construction material." The photos and text quoted here were originally published in issue #56 of a Croatian magazine called ORIS; they have been reproduced with kind permission of Hinterreiter and Thaler. [Images: Photos by Wolfgang Thaler]. 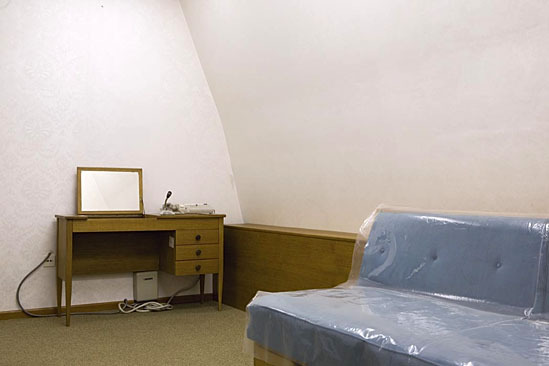 Reminiscent of the book Waiting for the End of the World by photographer Richard Ross—of which you can see many examples over at GOOD—Hinterreiter and Thaler show us a strangely preserved world of plastic-wrapped couches and vintage telephones, track lighting and glass-framed photographs. All basic functions are organized in simple metal structures, aligned within a tunnel-like space. In the centre of the horseshoe-shaped footprint lies an elevated block, whose design exceeds purely functional considerations. It is elevated above the rest of the facility and contains interior design components not found elsewhere in the fallout shelter. 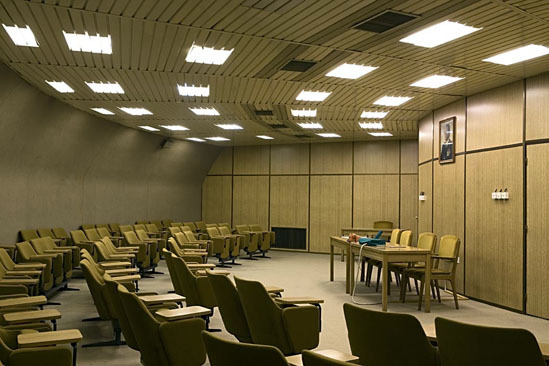 It was for use by upper echelons of the Yugoslav government. Variously ornamented wall papers, kept in garish colors, cover most walls and arches. Patterns and shades of green vary from room to room and characterize each space. The surface driven spaces provide no clue about the nature of their organization or construction. It was a kind of subterranean Motel 6 in which guests could wait-out the apocalypse. 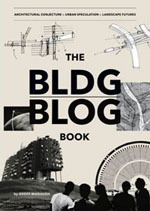 Such patience would require an extraordinary technical apparatus, however, something that might allow a state of self-imposed quarantine to exist; between the bunker-dwellers and the obliterated surface of the planet above them stood complex networks of ventilation equipment and back-up generators. Twice a day, air-handling units pump fresh air through a labyrinth of air ducts to maintain 21-23°C temperature at 60-80% humidity. Two transformers are on alternating duty to supply electricity. The water reservoir is filled with potable water from the adjoining Bijela Neretva river. Still modestly filled fuel tanks are ready to supply stand-by emergency generators. Various archaic-appearing mechanical systems would have guaranteed automatic seclusion from the outside world and the engagement of self-sustainable building systems, providing an autarkic survival space for 350 people over a period of months. 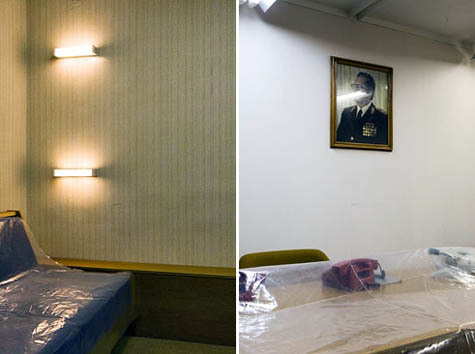 What was in the event of a nuclear attack supposed to ensure the survival of the political and military elite of the Socialist Federal Republic of Yugoslavia now fills solitary spaces with fresh air and illuminates Cold War military artifacts for visitors, interested in the fiction-like premises of nuclear bunker D-0. The geographic advantage of Bosnia and Herzegovina, being completely surrounded by other Yugoslavian republics, led to the establishment of strategically important industries in the country’s inaccessible valleys. A network of underground control posts, ammunition factories and power plants lies beneath the country. But then, of course, all geographies come with strategic implications; filling the valleys of Bosnia and Herzegovina with military installations should thus come as no surprise. The caves, which are known locally as the Labyrinthos Caves, consist of about two and half miles of interlocking tunnels with widened chambers and dead-end rooms. 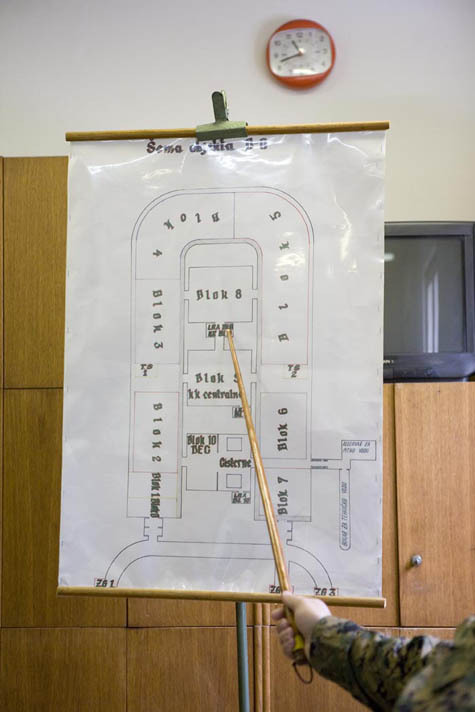 They have been visited since medieval times by travellers looking for the Labyrinth, but since Knossos was rediscovered at the end of the 19th century they were neglected, and were even used as a Nazi ammunition dump during the Second World War. 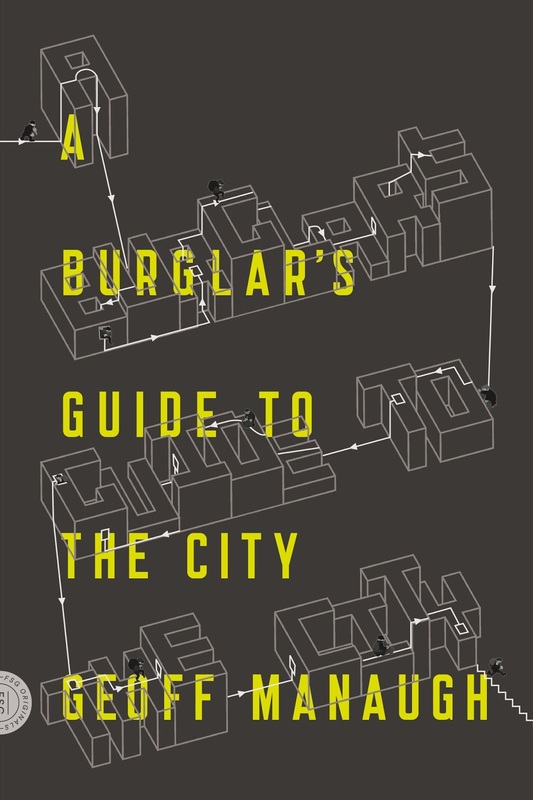 I mention this because the urge to build labyrinths—in stone or in tufa or against the detonations of nuclear war—often seems to transcend those labyrinths' purported use-value. As Hinterreiter himself might say, constructing a labyrinth of any kind "exceeds purely functional considerations," sliding off into mythology before too long and adding an oddly sinister veneer to any civilization that pursues it. In other ways, I'm reminded of stories like Seymour Cray and his obsession with tunneling, or William Gass's unreadable novel The Tunnel, even the Mole Man of Hackney. Of course, it would be wrong to over-blur these contexts and ignore the clear, functional purpose of a nuclear bunker; but it's hard not to wonder about the psychological implications of living underground for extended periods of time or, indeed, what strange impulses might compel a society to seek refuge beneath the surface of the earth—Hinterreiter's "automatic seclusion from the outside world"—in the first place. This is what BLDGBLOG has previously referred to as "psychology at depth." 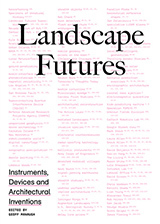 In any case, the ORIS article ends with a quotation from Paul Virilio. 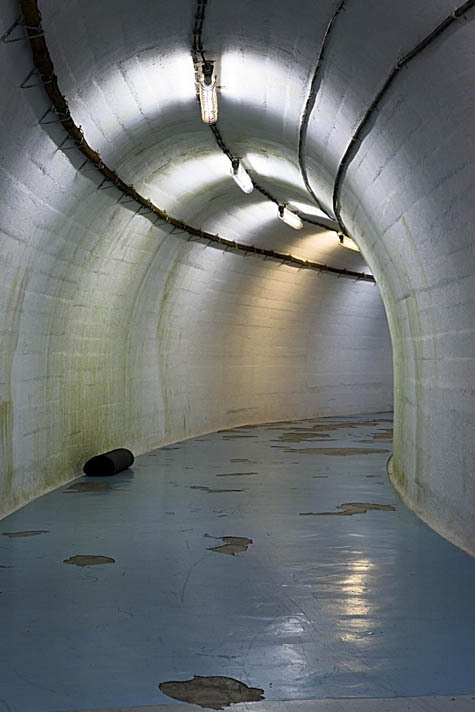 He suggests that the now-purposeless and abandoned bunker pictured here "joins a row of defense installations such as the Atlantic Wall along the French coast or the DEW Line in North America, which are not only heritage monuments of contemporary history. They remain to remind 'us less of yesterday’s adversary than of today’s and tomorrow’s war'." Check out Hinterreiter's website for even more photos and text. - The Greenbrier Resort/Bunker in West Virginia. - The end of Terminator 3, when John Connor heads to an old, unused, plastic-wrapped bunker that looks remarkably similar to the pictures above. More than any of the other subterranean delights you have previously discussed this reminds me of Kafka's Burrow story. It parallels the mole's obsession with security and the relationship between his internal world of the burrow and the external world, and the camouflaged entrance linking the two.